Do demons exist? Have you ever encountered cosmic powers in this present darkness? I don’t often think very heavily about demons and their place in my world, but this book, The Canary List, will make you reconsider the topic. I love thrillers and suspense novels, and furthermore I love books that make me think. This book fit both of those categories. 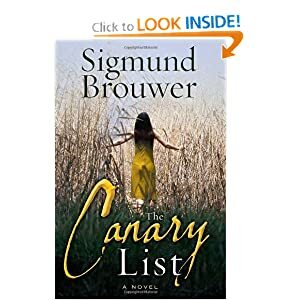 I would not recommend The Canary List: A Novel for everyone, but if you’re willing to be skeptical and intrigued for a couple of hours, this is a good book in which to do it. Sigmund Brouwer raises a lot of questions about religion, angels, demons, right and wrong, and does so in a fascinating and fast-paced novel. The novel is set in modern day America and Rome and centers around members of the Catholic church, a young girl, and an unsuspecting school teacher. The book spans only a week or so, and there are chases, interrogations, kidnappings, near-deaths, lies and a lot of mystery. Probably a wise move, Brouwer leaves the reader with a less than satisfying answer regarding his stance on demons and angels. After closing the book you will have to make the decision for yourself, but you will definitely be challenged to critically think through the topic while reading. The characters in the book are themselves split over the idea of demons, exorcism and cults within the Catholic church, so you can imagine that you’ll hear arguments for both sides. As a critical review of the story itself, I found myself completely enthralled in the story and flew through the book. Part of me was confused for a while, because there was something that failed to completely grab me in the writing, but the story had me. This could be attributed to the fact that most of the suspense novels that I have enjoyed have been written by the same 2 or 3 authors. I have grown accustomed to their style and Brouwer’s was slightly different from theirs. I cannot pinpoint his style exactly, so you will just have to read it for yourself. Again, from a critical standpoint, I was happy with the flow and timing of the book. I didn’t feel lost or like things had been made up or left out, though the meaning to the title came fairly late in the book. In a sense, I hope that the book isn’t very plausible, because I don’t really want to see this happening in our world, but at the same time it was very believable. If you have a few hours to spare, then head on over here to read the first chapter, and you’ll be hooked!